The next crazy announcement during the Asus Computex event in Taipei is the Transformer Book Trio - it starts off as your typical tablet with a keyboard dock, but morphs into a unit that runs both Windows 8 and Android Jelly Bean. We are not talking some sort of emulation here from within Windows - the tablet can switch to one or the other operating system, and even has two different Intel processors to support them, as well as two different batteries. If you need power for some real work done on a Windows computer, a Core i7 CPU is at your disposal, alongside a 33Wh unit "with up to 15 hours of battery life" when the tablet is docked into the keyboard part, which also houses a 750 GB hard drive. You can also connect the dock to an entirely different external monitor of your choosing, making the Trio a desktop replacement unit as well. 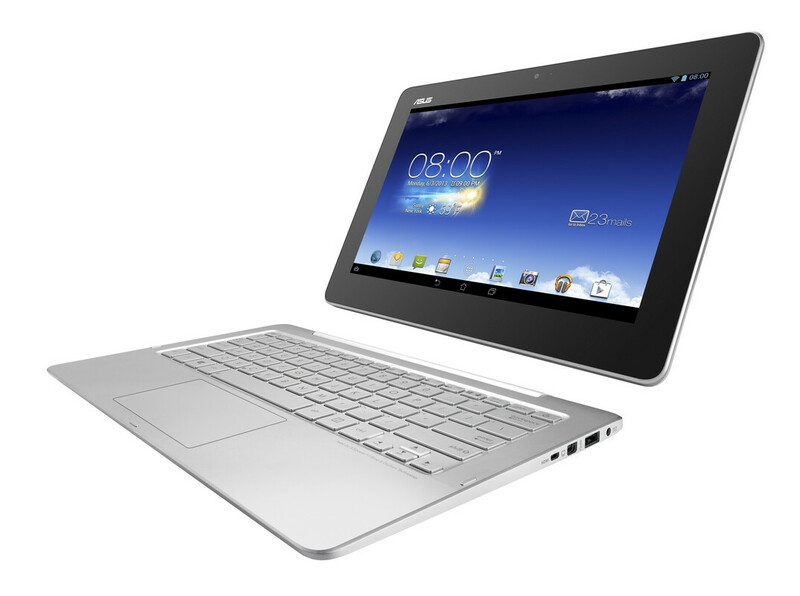 If you need some light tasks and entertainment with long battery life - a 2 GHz Intel Atom Z2580 chip will back up your Android session " from the 19Wh juicer when you detach the 11.6" Full HD 1920 x 1080 IPS-LCD display. 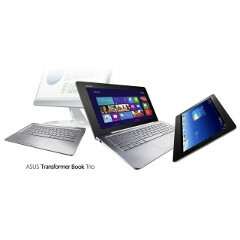 The tablet part sports 64 GB storage in its own, and Asus touts that "the Transformer Book Trio has been designed to smoothly transition between modes, allowing users to sync data or continue to surf the webpage they’re on even when moving from notebook to tablet mode." No word on pricing yet, but with a 4th-gen Core i7 and 64 GB of flash storage in the tablet part, the whole getup it will probably cost you, and we will know more when the Trio hits shelves in Q3. Intel and AMD in tablets is the future. This is where arms long trip to the depths of hell begin. omg Actually I've been thinking about this type of device all the way. tablet + laptop rendezvous for Android + windows. The spec and reasonable price is also awesome. Good job Asus. I want it! Just an idea it might not be possible but could you also install ubuntu on this and do a tri boot? if windows cannot use the Atom or Android cannot use the i7 when wanted it's a complete waste... even so, the separate operating systems in a device thing is a waste in itself. I hate needing to reboot. Windows can run off atom, the i7 can run android x86 but thats a bit overkill you would get like 120k in antutu. I'm sure some of the geniuses over at XDA will get it running android on the i7 if the device is rootable. your missing my point, yes Windows can run on atom, but will this machine be setup in a matter to allow such at will? And what is the resolution ??? 11.6" 1080 IPS screen. This monster also has a 1tb hard drive and a 64gb SSD! Why did PA leave this out!!! and then my jaw dropped..